My novel, Bestial, is a fairytale retelling which reimagines Beauty and the Beast. I thought about how I wanted to portray my main characters, my female Beast and my male Beauty in this reinterpretation, and how to write the relationship between a man and an inhuman creature. Then I realized: I know this! No, of course I didn’t have direct experience with mythical griffin-like Beasts, nor am I now or have ever been a man, but I have long experience with the working relationships between humans and some of the proudest, most intractable of inhuman creatures: I’m a falconer. 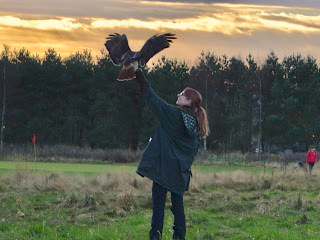 For the last six years I have had the privilege of working with a wide variety of birds of prey while I lived in Scotland, and am currently pursuing the various permits and licenses in order to continue practicing now that I live in the USA. For much of that time I was employed in this capacity, doing educational displays at a wildlife park, and enjoyed the great amusement of being able to write “Falconer” on the line marked “Occupation” on boarding cards every time I took a transatlantic flight. It gave me and Border Control something to chat about, and goodness knows they need a bit of entertainment during their day. But above all, I got to develop relationships of trust with the birds I worked with, and grew to love them all for their fierceness and their independent nature. It began with my educational work, but I was soon determined to experience true falconry – that is to say, hunting with a bird of prey in their natural environment, and since then I’ve hunted with a male German Goshawk and a male Red-tailed Hawk. When you fly a hawk you cast them off your glove totally unencumbered, apart from the leather anklets and jesses they wear which are designed not to hinder flight and perhaps a telemetry tag in order to track them should they be drawn out of sight by the hunt. They’re completely free-flying wild birds, and the only thing keeping them from disappearing over the horizon is the trust you have built with them. It’s an awe-inspiring act to call down the hawk you’ve trained out of the high branches of a tree, and to have him respond to your whistle, glide down with outspread wings and alight upon your glove in perfect trust and partnership. He trusts that you’ll provide him with the chance to do what he does best; you’ll help him locate his prey, flush it out for him to catch, and help him secure it on the ground. He trusts that if he misses he won’t go hungry. He trusts that if he gets injured, you’ll care for him. Life with you is far more beneficial than life without you. In return, you trust that he will stay by your side, in a not-too-distant tree, watching your every move, waiting on your word, and allowing you to take part in his wild existence. So when I sat down to write about a man and a Beast and a love story that wouldn’t choke the feminist in me, I drew from this experience of trust and partnership. I wrote what I knew. It didn’t mean that I needed to restrict myself in any way, I could still write about fantastic creatures and unknown places. I didn’t need to write autobiographically, this could still be a fantasy novel. Only I could now write my character’s burgeoning relationship with authority and believability, drawing on my own depths of knowledge on the kind of relationship I was describing. While I don’t believe that an author must always have personal experience in everything they write about, there are some things you just can’t easily pretend to know without true experience, and Google doesn’t replace foot-on-the-ground research. I’m reminded of a fairly silly romantic comedy movie, The Decoy Bride, set on a fictional island in the Outer Hebrides. David Tennant plays the character of a writer who set his bestselling novel on the island, but never set foot on it until later events bring him there when he attempts to discreetly marry his famous actress fiancée. Hijinks, obviously, ensue. His fictionalization of the island becomes a point of tension and comedy between him and the island inhabitants, and he finds that the reality of the island is very different from what he described. This is a real danger for a writer who might choose not to write what they know or, perhaps more accurately, choose not to know about what they write. Not only the danger that you might be wrong, but that you might be ridiculous. But this can be prevented. In writing to the second half of Bestial, I decided I needed to draw from a greater canon of fairytales, especially those of the Grimm’s Brother’s collected folktales, because I couldn’t face either a moral conclusion in the style of the original tale, or a Disney-style happy ending. I didn’t know these fairytales yet, but I knew I needed to. So I studied them and their history, drank them in, read every tale I could find in every spare moment I had until I did know them. I made myself an authority on a subject where previously I could only profess ignorance. But, above all else, you need to be an authority on your book itself, your book’s world and those living within it. This is especially true for fantasy, science fiction and other speculative fiction because, as your world’s creator, if you aren’t the authority on it who can be? So don’t be too quick to dismiss the trite advice often handed out to writers. Sometimes you may find that there’s a reason why a tired old idea is so old and tired, and that maybe, just maybe, it’s right. 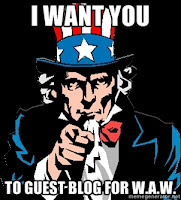 If you would like to guest blog for Writing About Writing we would love to have an excuse to take a day off a wonderful diaspora of voices and you can even make a couple of bucks. 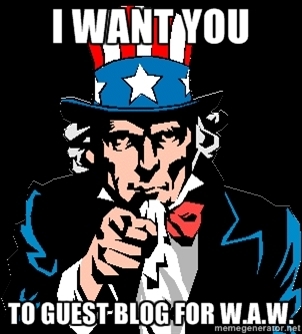 Take a look at our guest post guidelines, and drop me a line at chris.brecheen@gmail.com.